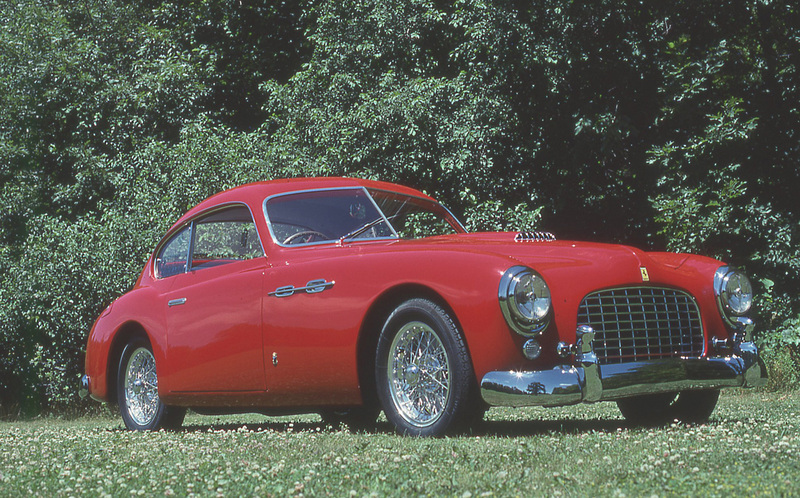 When recounting the story of one of Ferrari’s earliest models, the 166 series of coupes, cabriolets and barchettas, names such as Carrozzeria Touring and Vignale play an important part. Theirs was the job of providing coachwork for most of the early two-liter Ferraris. This reprint is based on a story written by Alan Boe that appeared in VeloceToday.com as well as Cavallino magazines. Farina, not Pinin Farina, sir. At the time of its involvement with Ferrari, Stabilimenti Farina, located in Turin, Italy, was also producing berlinetta bodies for Fiat 1100 B and 1100 S chassis that bore great similarity to those designs created for Ferrari. This combined with the rather sober tone of their designs, probably cost the house of Stabilimenti Farina the job of producing additional Ferrari bodies. 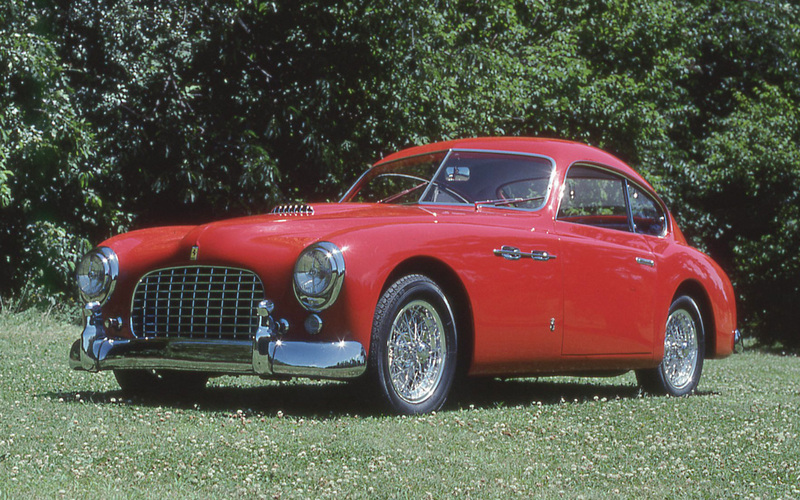 But while its creations for Ferrari were not as sporting as those produced by Vignale and Touring, the Stabilimenti Farina Ferraris certainly are interesting cars. For example, two of the five coupes and the last of the three cabriolets are some of the first Ferraris to feature the yet-to-become-famous egg crate grille. Stabilimenti Industriali Giovanni Farina began as a business in 1905, having been founded by the elder brother of Battista “Pinin” Farina. Giovanni Farina’s firm, in addition to providing some notable coachwork for Italian automobile manufacturers, is also renowned for its very distinguished list of alumni. Mario Boano, Giovanni Michelotti, Alfredo Vignale, and “Pinin” Farina all learned their craft and developed their design skills while working at Stabilimenti Farina. 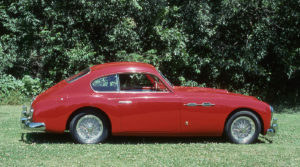 The Farina Ferrari was along the lines of the Cisitalia 202, but a higher cabin and more bulk made it look less svelte. In the late 1940s, Franco Martinengo headed the design office at Stabilimenti Farina. 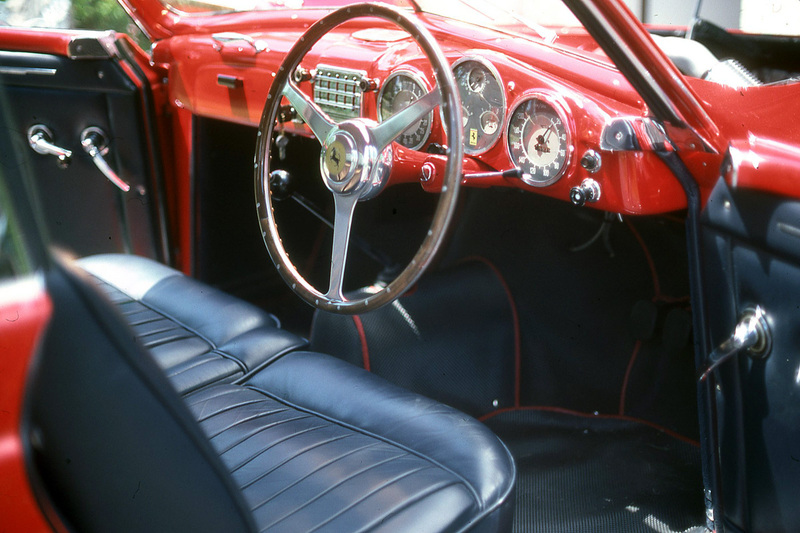 Michelotti was a designer there, and Vignale managed the panel beaters employed by the company. 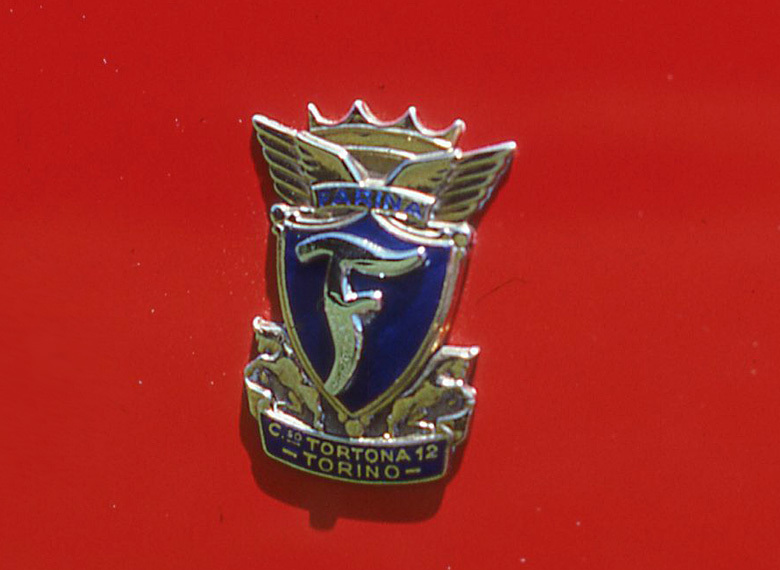 Under Martinengo’s leadership, the nine Farina Ferraris were built. 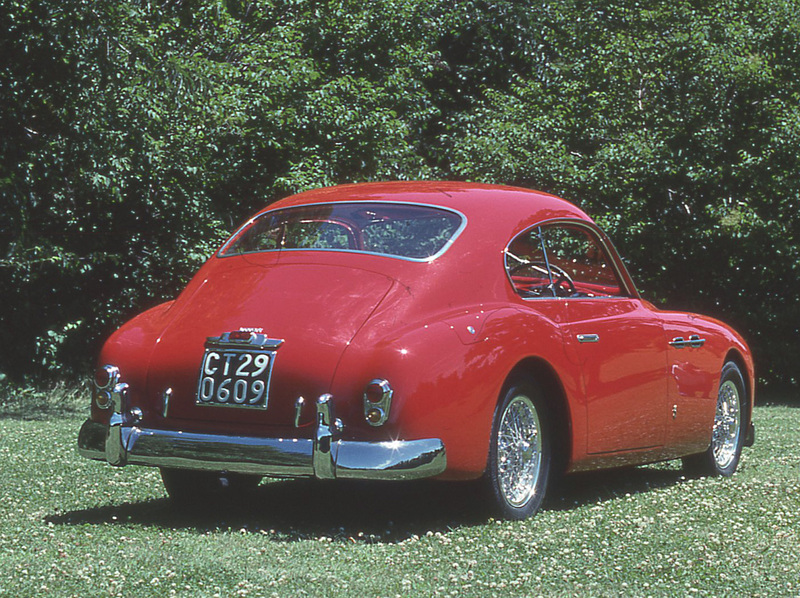 The cars each reflected the design elements of “Pinin” Farina’s 1947 Cisitalia 202, the styling tending to be heavy and slab-sided. 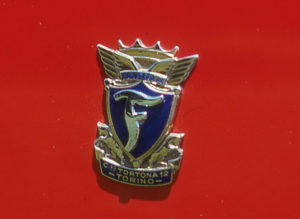 But brief though the association with Ferrari was, Stabilimenti Farina’s efforts on behalf of Ferrari are an important part of the company’s early history. It appears that perhaps four of the five 166 Inter Stabilimenti Farina coupes have survived. The last of those five cars is the car featured on these pages (chassis number 041 S, engine number 041 M.) It has the distinction of being the second Ferrari coupe to be imported into the U.S., and either the fourth or fifth Ferrari of any type to come ashore here. Working with Luigi Chinetti, the Ferrari Factory, and Ferrari’s representative in Paris, J. A. Plisson, D. Cameron Peck of Chicago managed to acquire this coupe when new. 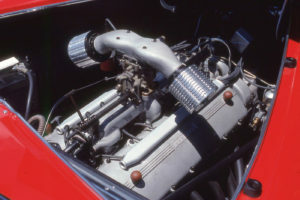 The engine was the 2 liter 166 Ferrari. Powerful for its size, it nevertheless did not please its new owner. In the 1940s and 50s, Peck was busy assembling his automobile and power boat collections which, at their peaks, numbered more than 300 vehicles and dozens of boats. The automobile collection included a wide range of Rolls-Royces (most of the years between 1905 and 1940 were represented) as well as many prewar Mercedes and other classics. Apparently, Peck became aware of Ferrari through the car’s exposure at the Swiss Revue Automobile Show early in 1950. 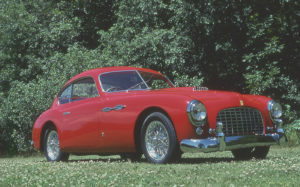 Correspondence between Peck and Plisson in April and May of 1950 reveals that Peck had placed an order for a Ferrari that was identified by Plisson as a Mille Miglia Special. However, the car was not ready for delivery when promised because, as Plisson wrote, “Mr. Ferrari wanted you to have the latest chassis.” Peck took the delay in stride, however, and soon thereafter word was received that Stabilimenti Farina had finished the bodywork for Peck’s car, that Luigi Chinetti would travel from Paris to Turin to inspect the car, and that it would be sent to Maranello for final tuning in preparation for shipment to the States. Typical Italian appointments for the era. Peck’s records of the Ferrari, detailed though they are, do not reveal when the car left Italy or arrived in New York, but we do know that the price paid was $15,500, a tidy sum in 1950 dollars. When word of the coupe’s arrival stateside reached Peck, he dispatched Henry, the family chauffeur, to New York via rail to retrieve the Ferrari and drive it back to Chicago. All went well for about the first 500 miles, but near Pittsburgh, Pennsylvania, major mechanical gremlins struck the Ferrari, and the car had to be parked. Try to find parts for a 166 Ferrari V-12 engine in western Pennsylvania in 1950 – obviously impossible. When Peck learned of the car’s dilemma, he dispatched Hal Ullrich, the curator of the automotive museum, back east, this time with a Bowman trailer and a V-16 Cadillac to do the towing. That worked, and soon the Ferrari was introduced to its new owner in Illinois. When the engine was opened up in Ullrich’s shop in Evanston, Illinois, it revealed a string of damaged valves caused by the failure of a bolt that was responsible for securing the engine’s timing chain. Ullrich cabled Chinetti in New York for new valves and other engine bits only to learn that the whole shootin’ match – block, head, and engine innards – had to go back across the Atlantic to Italy in order to be repaired. Disappointed but not defeated, Peck had Ullrich send the engine from s/n 041 S, his first, and as it turned out, his only, Ferrari, back to the factory from whence it had recently come. Several months later Peck was notified via correspondence signed by Enzo Ferrari himself that the repairs had been completed and the engine was returned to Peck. When he was finally able to get in the car, Peck, who was used to low-revving, high torque, big displacement engines, expressed displeasure with the performance of the Ferrari. He was not used to engines such as the 166 V-12 that required constant maneuvering of the five-speed gearbox in order to keep the engine’s RPM within the relatively narrow power band. 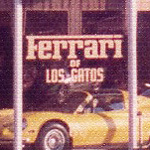 The little Ferrari was promptly put up for sale, soon to become the property of Dr. Samuel Scher of Park Avenue, New York City. Hopefully the bumpers were for the American market only. The car’s history does not tell us how long s/n 041 S remained in the Big Apple, but in the mid-1950s, it showed up on a used car lot having rebounded back to Chicago. Don Porter, a Porsche, Jaguar and Mercedes enthusiast from Milwaukee, rescued the car and took it back to Wisconsin. In December 1956, Walter Baars, a Milwaukee suburbanite, bought s/n 041 S, drove it briefly and then decided to restore the little coupe. The strip down process began, pieces came off and out of the car, some restoration work was started, and then Baars’ enthusiasm ran out. The Ferrari and its boxed bits and pieces were banished to a spot outside Baars’ where, a little later, Baars literally built a new garage around the car, and its nearly thirty-year hibernation began. 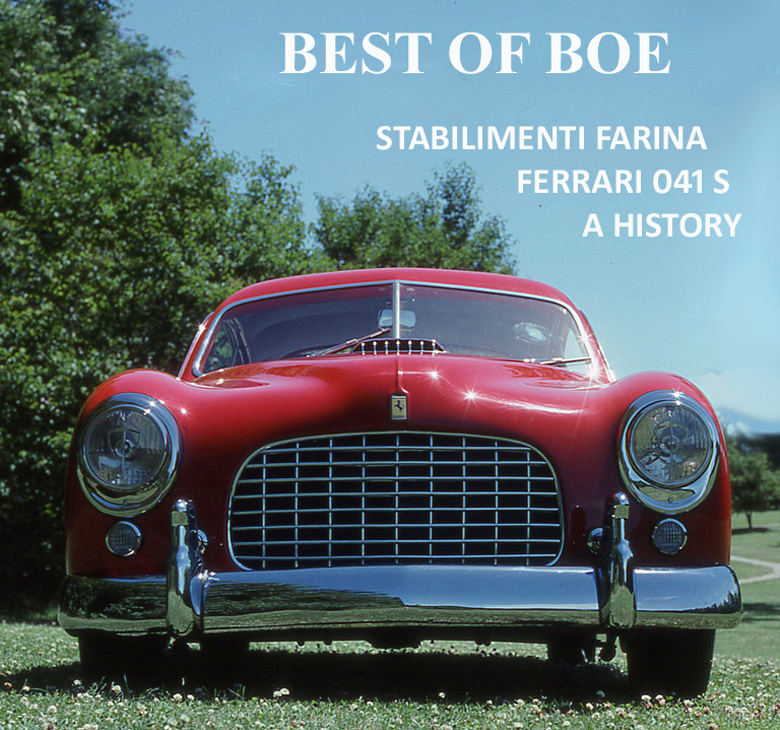 Conservative to modern eyes, the Farina Ferrari was still a very attractive and advanced car for the era. Fast forward to December 1986. For some time prior to 1986, local enthusiasts who were aware of the Ferrari had tried to secure its purchase from Baars but without success. 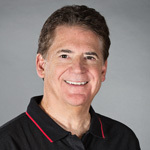 Enter Glenn Hanke, an engineer and department manager with Allen-Bradley Corporation in Milwaukee, and a Ferrari enthusiast. Hanke, who lived just five miles from Baars, had been aware of the old Ferrari for almost twenty-five years and had offered to buy the car on various occasions but nothing happened. Not until Christmas of 1986, that is, when Baars suddenly decided to sell the car to Hanke. What Hanke bought was an old Ferrari stuffed full of car and non-car parts that were being used by a family of rodents as an apartment house. The coupe was almost completely covered by thirty years of accumulated garage garbage, dirt, dust, and trash. But buried beneath the rubble was the 166 Ferrari Inter coupe. Undaunted, the Hankes, Glenn and his wife Lynn, trailered the Ferrari back to their home near Caledonia, Wisconsin, and began the arduous task of inventorying and identifying what they had acquired. Surprisingly, very few parts from the old car were missing. Glenn began the car’s restoration by stripping the original blue paint and removing and disassembling the mechanical parts from the car, but early on in the process, it became apparent that the non-mechanical part of the restoration would have to be farmed out. Joe Pizcazzi, who owns American Auto Body in Akron, Ohio, and who has turned out some exquisite restorations of vintage Ferraris, was given the task of redoing the body, bright work, and interior. The engine rebuild was done locally by the car’s owner and required the fabrication of those pieces that were missing or were unusable. Testimony to Glenn Hanke’s skill and ability to bring life back to the old V-12 is the smooth yet powerful way the rebuilt 166 engine delivers its message to the road. Note the egg crate grille, associated with Touring-bodied Ferraris and was to become a Ferrari motif that lasts to this day. As in any major restoration project, there were many people besides Pizcazzi and the Hankes who left their imprint on the car. For example, the headlights and surrounds came from Edsel Pfabe of Fort Pierce, Florida. Others who offered advice and help with the restoration included such people as Hal Ullrich, Tom Caulfield, Ed Gilbertson, John Hajduk, Dale Miller of the Miles Collier Automotive Museum in Naples, Florida, and Margaret Peck, D. Cameron Peck’s widow, who furnished much of the car’s early history. The three years of reconstruction produced a finished 166 Ferrari coupe by early 1990. The Hankes unveiled their new car at the Ferrari Club of America’s national meet in June of 1990 at Watkins Glen, New York, where it was judged first in class and was awarded the beautiful Forza Ferrari trophy. A week later the car was shown at Joe Marchetti’s Ferrari Fantasia Concours in the Chicago area where it was judged Best of Show. Two weeks later the car was invited to Joe Marchetti’s classic car concours where the 166 Inter was Best in Class. In July, it was the “Peoples Choice” award winner at the Road America Chicago Historic Races Concours. Then, in August, the Hankes trailered the car to California in response to an invitation to display s/n 041 S at Pebble Beach where the coupe was a finalist for the “Most Elegant Closed Car” award. This story originally appeared in Cavallino #63 and is published with permissions. Thank you to Editor Pete Vack of VeloceToday.com and author Alan Boe for allowing us to reprint Ferrari S/N 041S by Stabilimenti Farina. If you have any questions or know of a Ferrari or other classic car with a story, please share it in the comment section below.